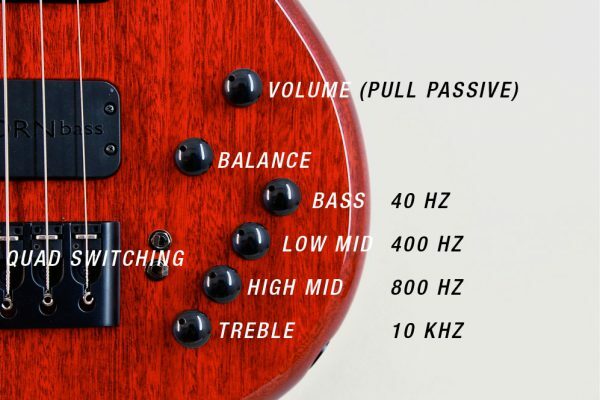 Options list on the bass guitars. Options means you can modify existing models to suit your style. This means a vast range of things to choose from. All prices are extra on top of existing model you want to set out from. 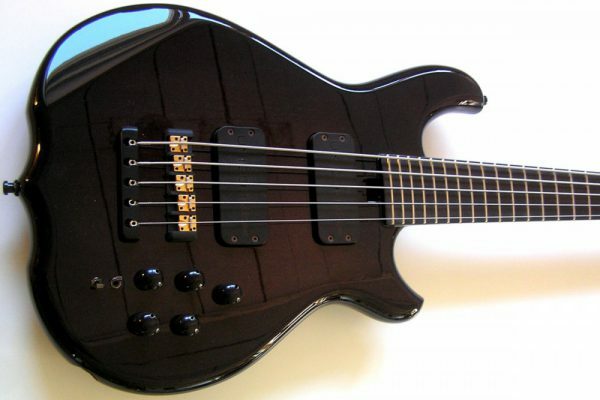 Some models may be "as is", for instance the Artist anniversary bass and can not be changed. 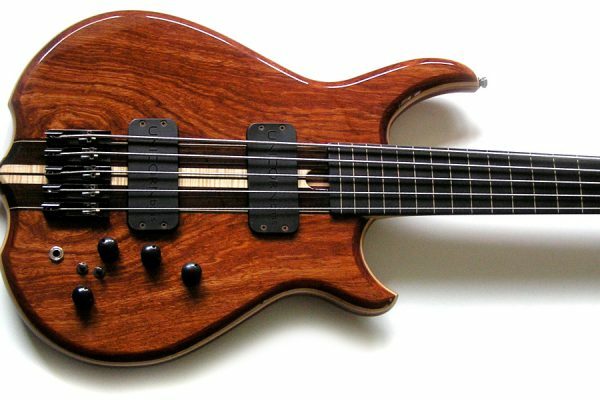 Fretless option is a more popular option these days. Some people want the natural tone that this gives. Especially for jazz and smaller settings this is a nice option. Neck profiling takes me upwards three hours to do. Not because I am slow. 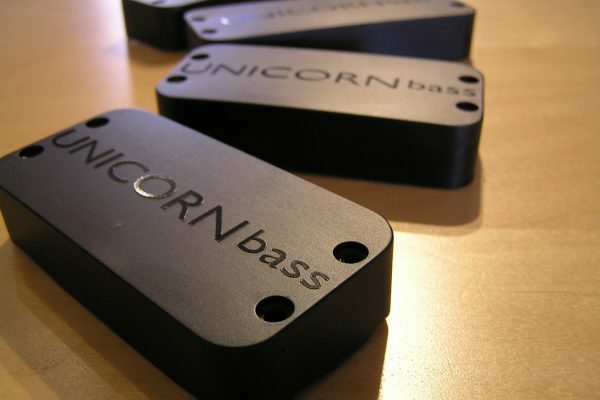 Because its of upmost importance to your bass. A mm wrong and it feels awkward. I have made three profiles available as standard – YES, you can choose whatever you want! 1. D- shape. 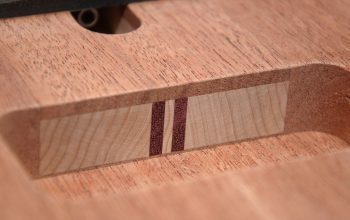 Not completely flat at the back sloping down to the fingerboard. 2. C- shape. Pretty round all the way, progressing more towards fingerboard. This is the shape most prefer. 3. Hybrid of the two. 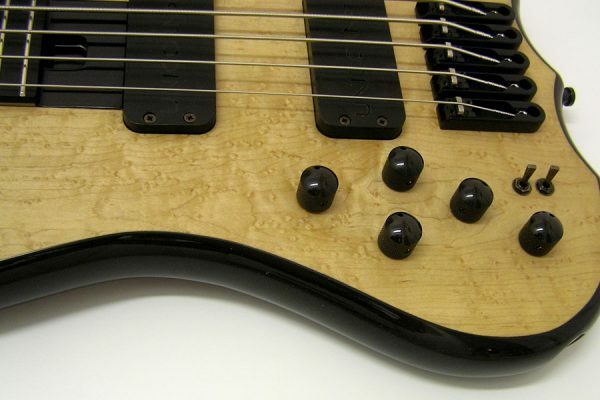 even though the body has a comfortable 19 mm radius (almost completely round) most players want a elbow cut on their bass. 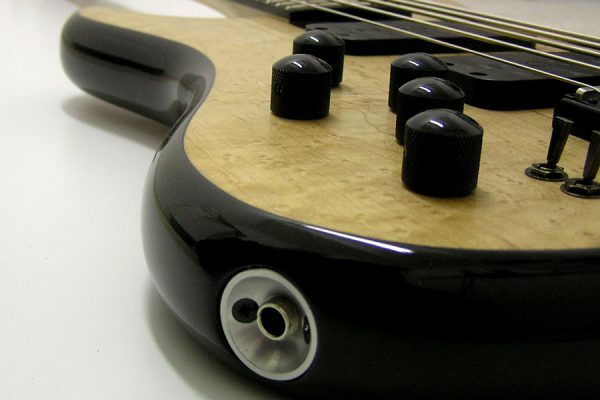 This gives a smooth "armrest" on the bass as in the picture. For some player this feature is a no-no. For some a rib cage saver, for some very comfortable when hung low for their belly. It´s a matter of taste. Neck width is a very personal preference. 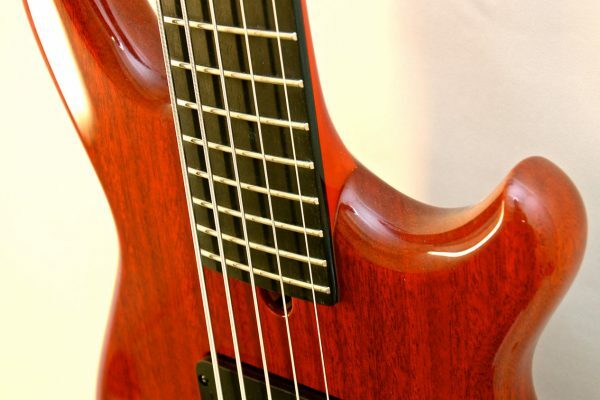 90% of players wants 19 mm spacing at bridge for 4 string, 18 mm for 5 string and 17 or 18 for 6-string. Most builders offer a standard size – That´s it! 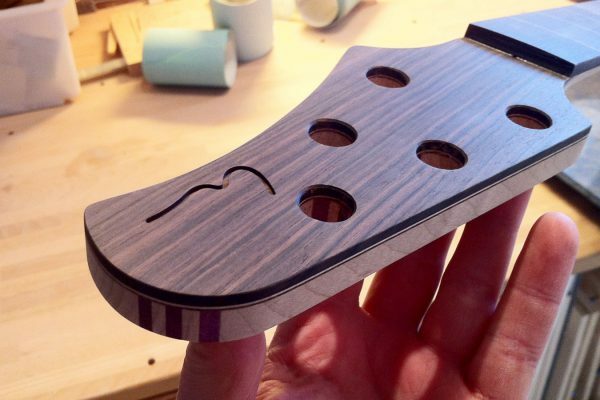 Most understandably, If you make necks the proper way – with templates, it gets real expensive real quick with all the combinations so If you strive from the standard neck sizes It´s available at a cost. * standard neck size. All other at extra cost. 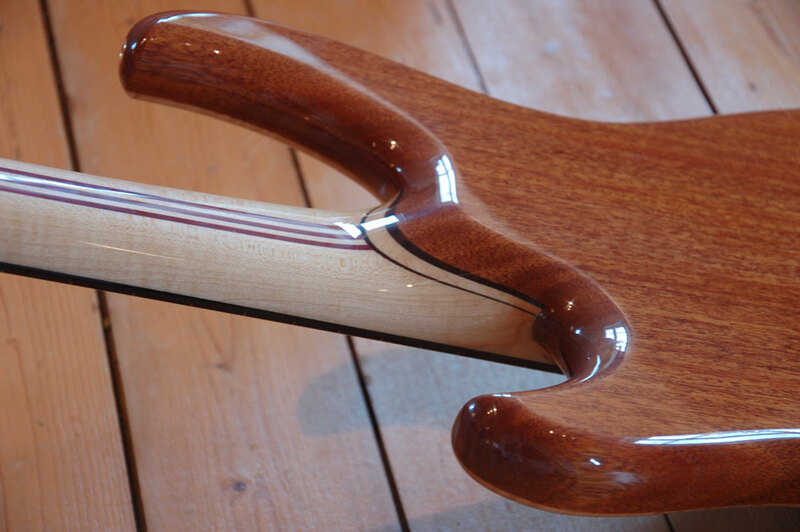 If you want custom sizes at nut it is available at an extra cost on top of neck size option. Scale length is a very personal preference. some like the organic feel of the shorter 32" scale, some prefer the extra tension of 34". As it is now the Artist can be had with either 32" or 34" scale, the ozellman 34" only as standard due to physical properties. 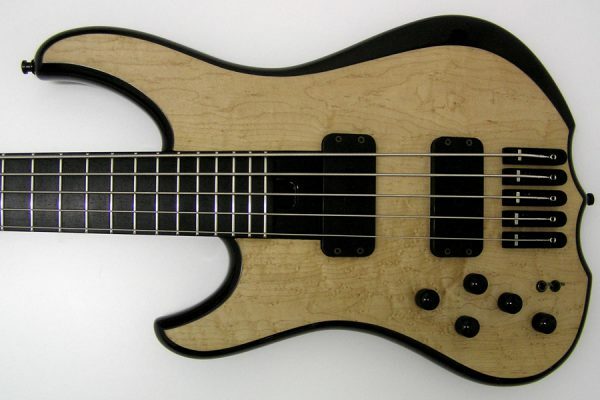 With the construction I use in my basses, the need for longer than 34" is really not necessary. This option is free of charge on all models. 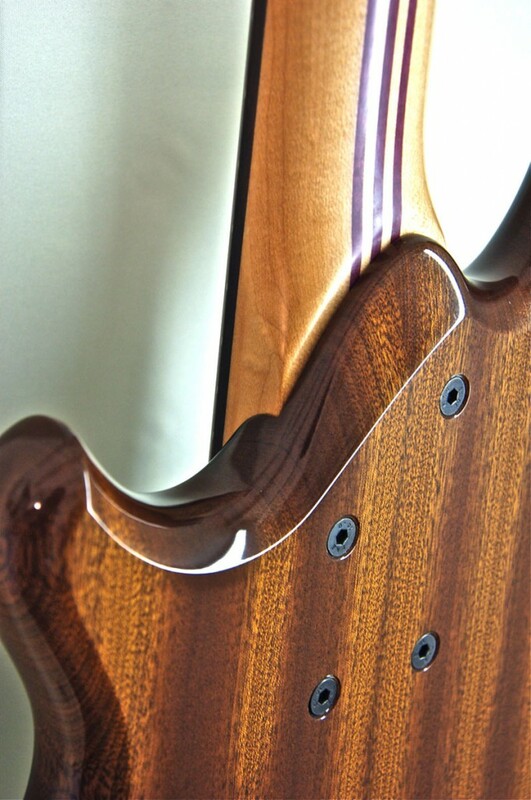 laminated centerstock is both visually striking and changes the overall tone. All depending on the woods and number of laminations. 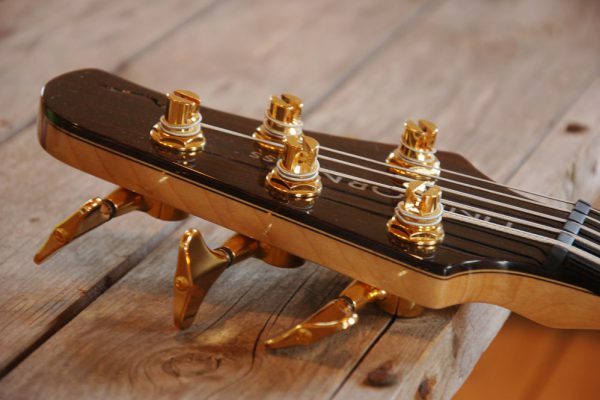 this option is not only very good looking, it is a reinforcement of the headstock, laminated with either rosewood or santos it gives a higher strength to the headstock wich is very strong from the beginning. Theoretically it also gives higher pitch to the resonant frequency aiding harmonics content. But that´s just theory. I haven´t tried it yet on so many similar setups to be conclusive. For the connoiseur this option is the "sovereign" option on the bass. 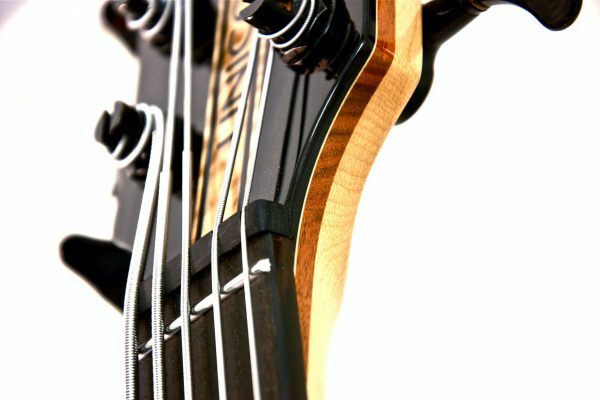 giving an almost over-indulgent feel of luxury on the bass I can use almost identical wood or why not mix it up front and back. 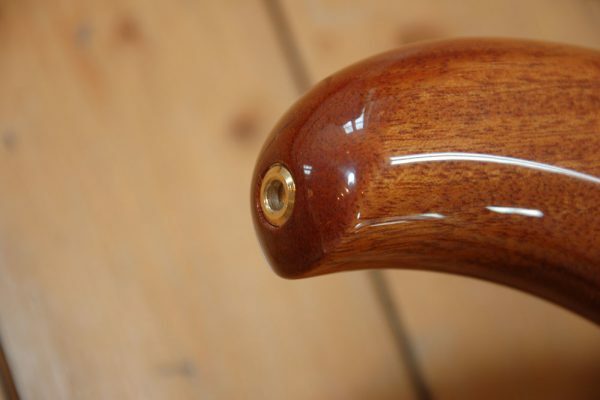 If you love wood craftmanship this is a very good option. 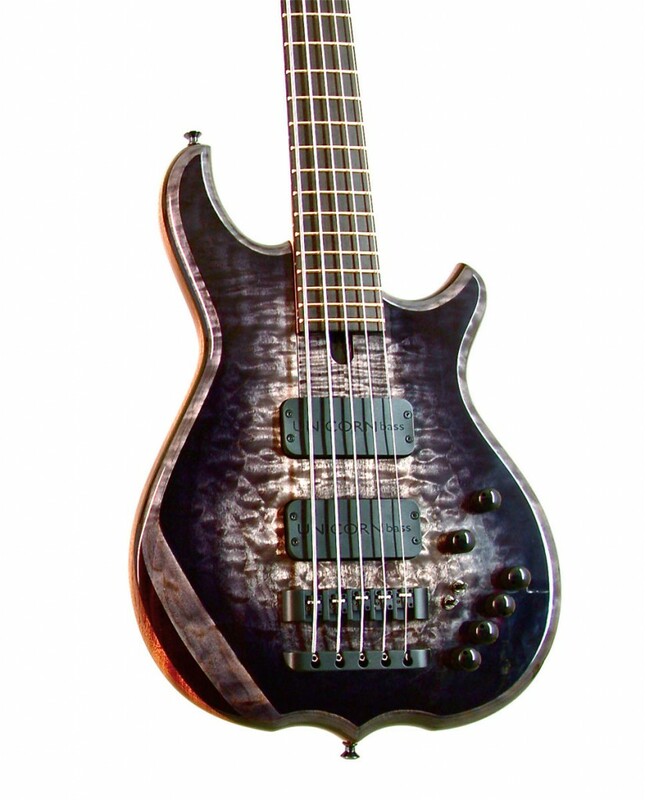 *available only on Artist and Ozellman Master series basses. 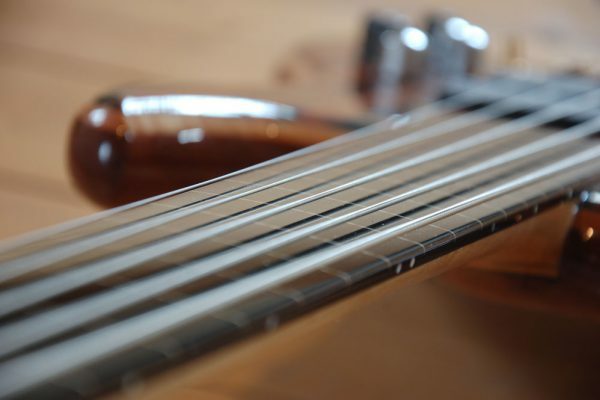 Some people prefer Monorail bridges over the traditional Two-piece on Artist or solid bridge on the Ozellman basses. I use black hardware as standard since as a designer I believe that the hardware should not be the one thing that is highlighted. However taste comes in and you can have both gold or chrome hardware as an option. 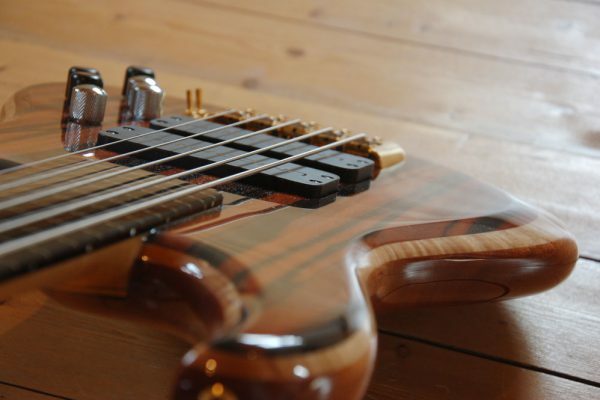 A very nice touch to any bass, this however goes one step further; even the flange of the insert is routed into the body so it is barely visible from side view. 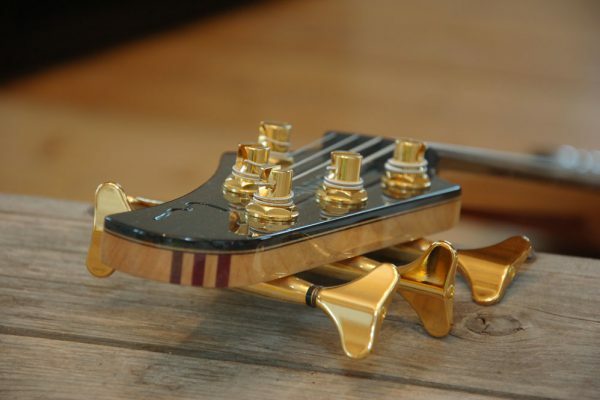 Hides away the strap knobs in a nice way! 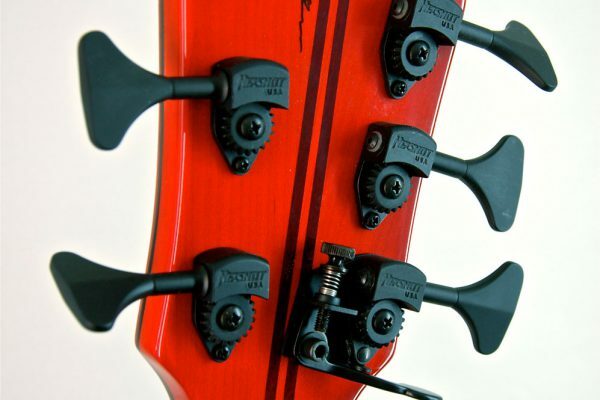 Hipshot bass extender. Drop down to D or whatever preset note you want. Some people use it to drop A on 5-string basses. Useful for a lot of situations. 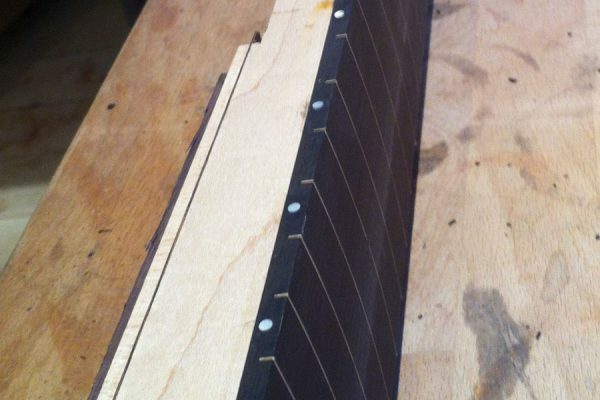 Fretboards contribute to the overall sound in a way many are not aware of. Macassar Ebony is a warmer sounding material with lots of harmonic content giving a lively tone with a accented top end. 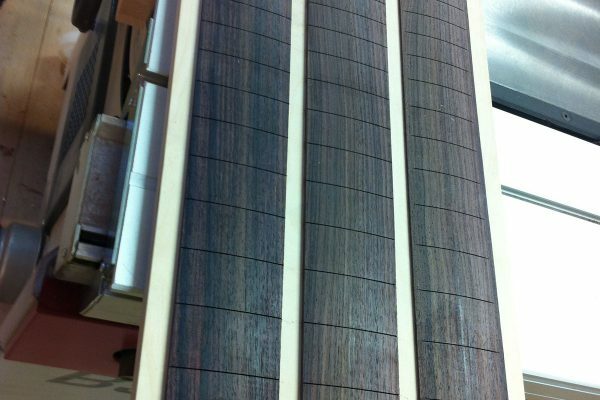 Very similar to older Brazilian rosewood! One of our customers favourites lately. Maple gives a bright harmonic content and good snap but low end stability and tone suffers a bit all things being equal. 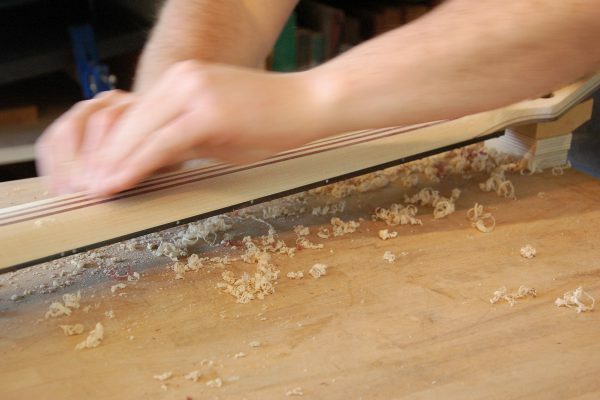 Sensitive to sweat and dirt we finish our boards. A pickup´s job is really just to pick up your strings vibrations. Simple job. Not so much. Because they very much colour the sound in different ways. That is why I use a developed in-house pckup system that brings out different "colours" out of the bass. 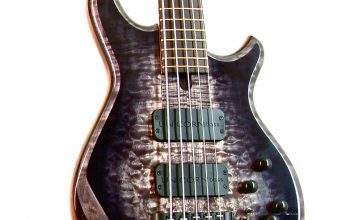 If the pickups were absolutely phase and frequency linear they would sound really boring. Combination of cleverly placed coils makes for 9 different sounds before even touching the pan-pot. And each sound is exiting! The pickups themself have 2 hardwired options: Lo or Medium Impedance. So basically its possible to have an internal switch at 1000 sek extra cost so you can switch back and forth. Lo impedance works best for full range bright sounds and medium works for all sounds and have more mid bouyance. 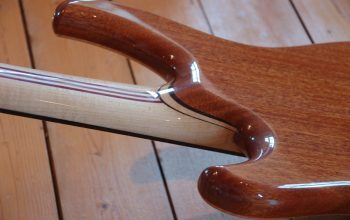 Placement of the pickups is a factor that affects the sound, not only individual but the space between the pickups affects the colour very much. 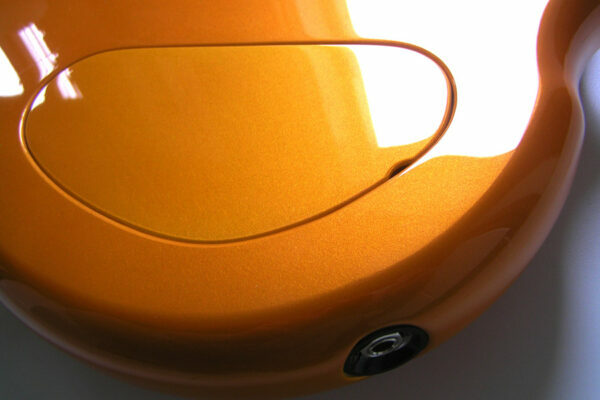 Some people wnt the pickups close together for a thicker sound with much colouring. Some prefer them widely spaced apart for that scooped deep growl. As a rule i recommend the bridge pickup to be *45-55 mm for a tight bridge sound where you can both get a tight hitech and fuller jazz-bass type sound and thick humbucker type sound. For the neck pickup i recommend *115-145 mm for a full and tight compliment to the bridge with a sweet sounding neck pickup. Coils are 26 mm apart on PAF and 30 mm on the SSC. So a 115 mm placed pickup will have 100/130 coil placement. 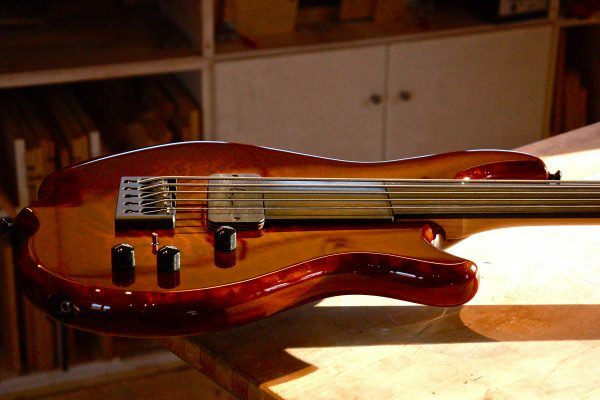 *All measurements C/C Gstring bridge saddle to pickups center. 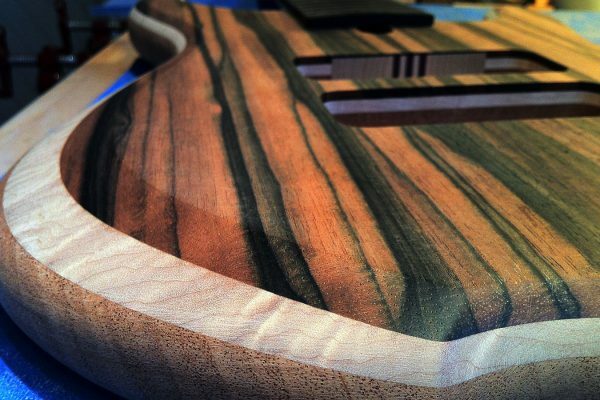 Imagine the feel of wood under your fingers! 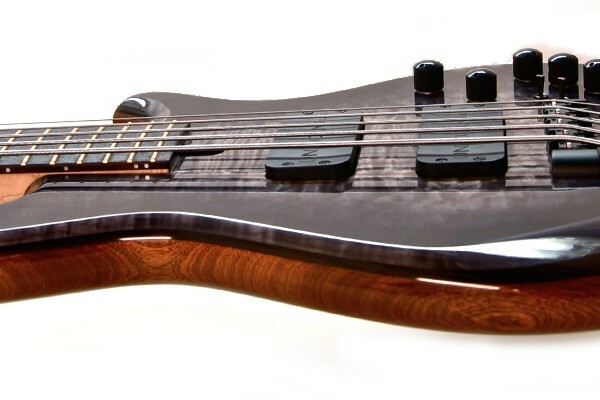 Laminated ebony covers look so good and can really enhance the look of any bass. Available with or without maple stripes over the front. Can be had with the height screws at the back giving it a very clean look! 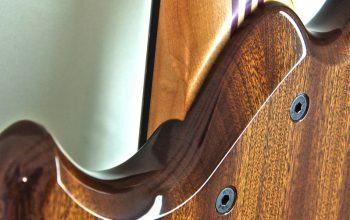 Ramp out of ebony or same wood/ colour as the top of the bass. Some players prefer this as it gives a very uniform feel and reference point for plucking fingers across the body. Passive option available, please contact for info. This option is available with hi impedance special pots and selected capacitors with straight thru special switch for very little signal loss. Some prefer the output jack side mounted, some prefer it front mounted. I can offer both. Side mounted offers rigidity and some people want side mounted for various reasons. Front mounted is the traditional way of mounting the jack. This finish is what i call the best of both worlds – It protects from moisture/dirt and it hardens the surface in a way no oil can. Hence you got no sound muffler and you get the look and feel of a natural wood with the benefit of a maintenance free finish. The sound is alive and very uch "breathing". 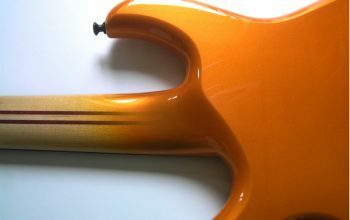 This finish is done by hand and is free of charge. And by the way, it´s very eco friendly. One of the most popular finish. And the most traditional. Basecoat that brings out the visual lustre of the beautiful woods and then several thin topcoats watersanded and buffed to a mirror shine. Both durable and protective. Quite a high class feel. 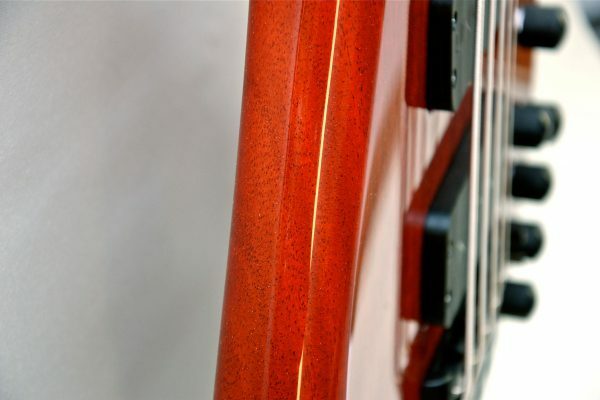 Translucent finishes are available in cherry – tobacco – black. Bursts also available as option. Stain is different from tint. 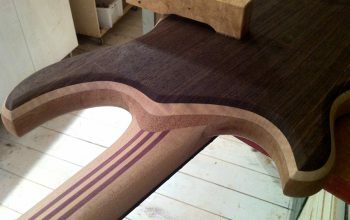 Stain is when colour is wiped into the grain swirl of the maple making for some drastic effects giving a very 3D effect to the bass finish itself. 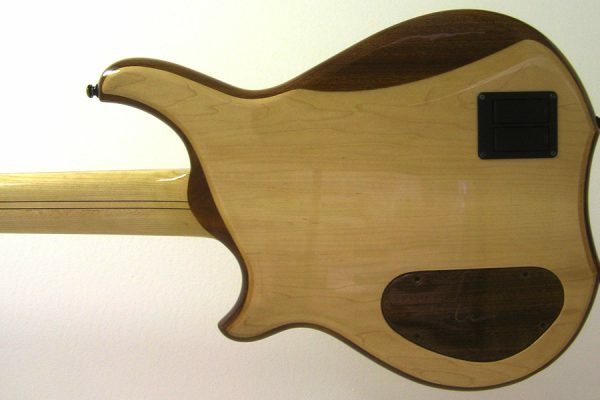 The bass in the pic has a natural back and masked off edges from the burst. The whole body can be stained though at no extra cost. Colours available: Black, cherry, blue, tobacco, amber red. *only available on master series with Quilt maple top. 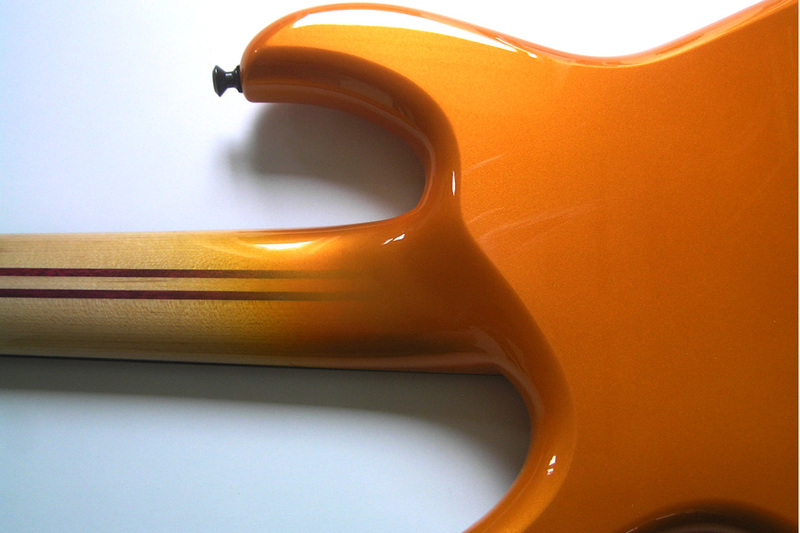 Pearl finishes are expensive and sometimes even three components. Lots of extra work but trust me, the end result is worth it.